There are many cleaning tips online, but it seems that not all of them will actually help if you’re trying to get a stain out of your carpet. In fact, some could even make it more difficult to remove the offending mark. The Express recently busted some cleaning myths, with the help of the Good Housekeeping Institute. One thing to avoid when you want to remove a stain is to pour water over it. This can not only damage the carpet fibres, but can also soak through and get trapped, the newspaper noted. Rather than doing this, you should use a carpet cleaning product, or try some soda water and then blot the stain with a cloth or clean towel. Another stain that many of us struggle to remove from carpets is red wine. One common piece of advice is to put salt on the stain. However, the Good Housekeeping Institute revealed that this can actually make the stain more permanent, even though it can appear to be working because the stain changes colour. 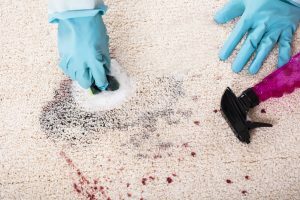 If you’re worried about making a stain worse, it might be time to get help with residential carpet cleaning in Liverpool rather than attempting to fix it yourself. There are often places in our homes that we can overlook when it comes to cleaning, such as our doormats, skirting boards and even light switches. All these areas can harbour a build up of dirt, so it’s worth paying them some extra attention from time to time. This entry was posted in Advice and tagged residential carpet cleaning Liverpool. Bookmark the permalink.